Don’t deny it-Trent Reznor loves controversy and attention. He’s tried to act like a seedy recluse with a bad chip on his shoulder throughout his career, but somehow, the public eye has stayed consistently focused on him. When Pretty Hate Machine broke into the mainstream and all that mess with TVT was publicly displayed, guess what? Reznor was practically begging for all the public attention he could muster. When The Fragile hit and he openly spoke out about how he was unhappy with the final product, he caught plenty of attention. When Marilyn Manson and Trent Reznor butted heads, he couldn’t keep his mouth shut. Only Trent Reznor would go off on a tangent about how “the record executives are ripping the fans off. So you know what that means? Steal, steal, steal my music. Go steal it, and steal some more!” Things like this seem to always turn the public eye keen to Trent Reznor and often get him in hot water. And throughout all the controversy over Year Zero, the Nine Inch Nails mastermind has stayed fairly quiet, going into hiding, yet again. However, this time, the infamous recluse didn’t stay quiet for nearly four years like before; he waited about half a year. All the while, Trent Reznor was secretly wasting away at the keyboards and synthesizers as the Nine Inch Nails fans prepared to settle in for another four to five year absence, messages on the Nine Inch Nails website blog began reading "We’ve been doing secret things. We’ll begin to tell you about them soon." On March 2nd, a simple message on the blog read "2 hours." Wasting no time, in two hours, a new website design was up with a download link. Despite the online server meltdown, Trent kept to his word and offered the album online in a variety of downloadable ways (one offering the first Ghosts edition for free), and one offering a $10 double-disk digipak shipped on April 8th. The album's release was so well planned and it's tactic of catching people off-guard may very well be the best planned album release in near history. The best part is that this is a 36-track instrumental album that nobody expected. Maybe its too early, or the shock factor is still there, but Ghosts is truly amazing. Trent has compiled a wide variety of unorthodox instruments, electronic tools, distorted guitars, lush soundscapes, and eerie sounds into this collection of Explosions in the Sky influenced Nine Inch Nails. On the online booklet, a picture is shown of one of the guys, during recording, rubbing aluminum foil on strings. That is what you can expect from the album-unorthodox sounds coming from unorthodox instruments and playing styles. You can still distinctly hear the Nails sound throughout the album, but the wide variety of instruments, the soundscapes, and the unusual guitar riffs make a strange post-rock influenced ambience. The initial response when I realized that Ghosts was a massive 36-track instrumental package was immediate excitement, but it then faded away. I imagined a boring album with 36 low-key instrumental tracks. But when I actually got Ghosts the feelings of being let-down left my body. The melancholic opening piano track sets such a dull, depressing feeling inside of you, and the same goes for the second track. But just as you begin to think this isn’t quite Nine Inch Nails, this is more Sigur Ros than NIN, you quickly discover you’re wrong. Very, very wrong. Because when you think you've figured out this is a piano-led album, songs like 3 (which is a lot like The Becoming) show up, or track 19 which wouldn't be out of place on a Skinny Puppy album, with all of it's heavy industrial beats. Basically, if you expected Ghosts to lull you with pianos, almost something in the vein of Still, you are quite wrong. Some of the stuff is heavy, loud, and aggressive, if not some of the loudest Nails music; 31 is like Hyperpower!’s aborted brother. Newcomer Brian Vigilone lays down a cymbal-heavy drum pattern and distorted guitars overpower the mix into a headbanger. And just as it gets loud, it ends abruptly. The album has no issue with flow, either. 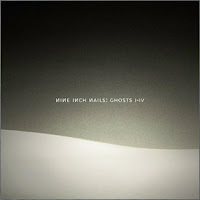 Despite being 36 tracks that span a wide variety of genres and phases in NIN’s career, the songs seep into one another, and the four Ghosts editions have four distinctive feels. Ghosts I has a melancholic edge, seemingly painting the picture for a cold, rainy day. Ghosts II has an upbeat, foreign edge that reminds me a lot of The Fragile, and Ghosts III comes off as an industrial powerhouse. Ghosts IV is electronic, funky, and danceable. The tracks are all distinctive, original, and grandly epic. You can’t confuse a track with another, they all stand-out. Some of the tracks are clear throwbacks to various areas in Nine Inch Nails’ career, while some offer new sounds and vibrations. However, Ghosts IV definitely the stand-out. It’s like a more fun, less repetitive, and danceable Year Zero. So it’s not like the album is droningly monotone with no separate areas and sounds, each Ghosts volume presents a new sound and aura to the mix. But what’s the best, most surprising about the album is how atmospheric it is. Every track creates a new sound, a new feeling you get lost in. The tracks won’t lull you to sleep, but they send you to another place, another place Trent Reznor and co. have perfectly handcrafted. But what else stands out on the album is the fact that Trent doesn't seem to be catering to the teenagers and what's popular anymore. The last two NIN albums seemed to be what the public wanted, not what Reznor wanted. At age 42, it was time for Trent to stop catering to what the public wants and to start making what he wants to make; no more overused angst, screaming, and profanity. This is proof that Trent Reznor has finally grown out of the teenage angst.